We are proud to announce that Willmore Condominium Association has selected Tinnelly Law Group as their association legal counsel. 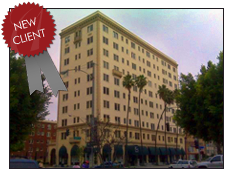 This beautiful 11-story building is an Italian Renaissance Revival, designed by the same architects that designed the Hollywood Roosevelt Hotel, and is a Historical Landmark Property. Residents of the building enjoy the ambiance of the past. As a historic building, The Willmore has preserved many of the original elements from the 1920’s. Along with the stunning solarium, most units feature city or ocean views. Our HOA Lawyers and staff look forward to working with Willmore Condominium Association.